Sea Towers is a 55+ condo community in St. Petersburg, Florida. 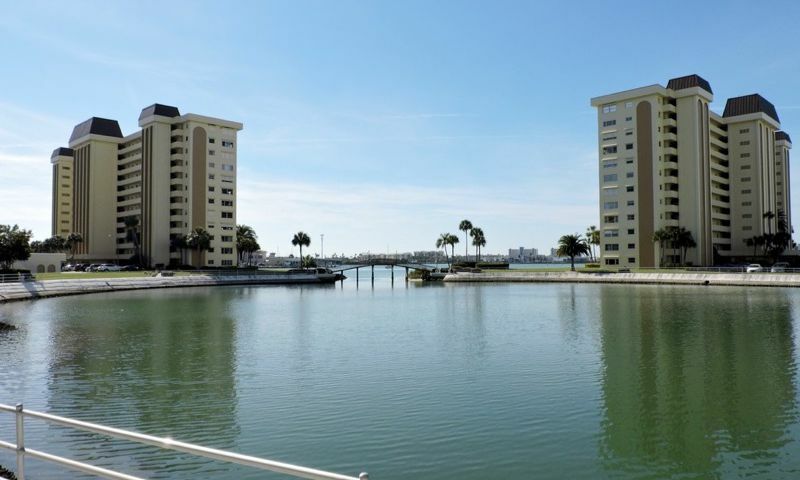 This gated active adult complex features nine high-rise condominium buildings that offer majestic views of Boca Ciega Bay and the Gulf of Mexico. Sea Towers is an established age-restricted community near Tampa Bay offering resale condo units within a resort-style setting and a rich line up of amenities and activities that appeal to the active adult homebuyer. Residents of Sea Towers enjoy a clubhouse that offers many amenities that keep them active and social. The clubhouse features a fitness center and sauna that is great for working out and relaxing. Homeowners can enjoy peace and quiet in the library and sitting area. They can play pool in the billiards room, poker in the card room, or hang out with neighbors in the game room. Residents can watch a show in the auditorium. The clubhouse also provides a catering kitchen that can be used to prepare snacks for club meetings in the multi-purpose room. Outdoor amenities are sure to please as well. Residents can swim a few laps in one of the two pools, host a party in the BBQ and picnic area or socialize with friends at the beach house patio. For more activity, homeowners can challenge each other at the shuffleboard or tennis courts. Residents can also enjoy lawn bowling and the putting green on a sunny afternoon. Homeowners can take leisurely strolls along the walking and biking trails that surround the scenic lagoon. Sea Towers has a fishing pier as well as a boat dock that offers covered boat slip rentals to residents. Cheezem Development Corporation built Sea Towers between 1969 and 1973. Sea Towers is comprised of nine high-rise condominium buildings. Condo units range in size from approximately 485 to 1,140 square feet. They typically offer a studio to two bedrooms, one or two bathrooms, and a parking lot space. Some condo units feature balconies or lanais, updated appliances, large kitchens, spacious living and dining rooms, Florida rooms, walk-in closets, and scenic water views. Each condo building has its own homeowners' association (HOA). Depending on the building and size of the condo, the HOA fee varies. Some HOA fees may include common ground maintenance, access to facilities, basic cable, exterior building care, and flood insurance. Sea Towers is an active community with plenty of things to keep residents busy throughout the year. A full-time social director helps organize events and activities for residents so they can interact with neighbors and make new friends. Residents can take aerobics, yoga, or water aerobics classes to stay in shape. They can play darts, bridge, bingo, pinochle, or Mah Jongg or go on day trips. With so many activities going on daily in Sea Towers, residents will never have a dull moment while living here. Conveniently located in St. Petersburg, Florida, Sea Towers is close to a wide variety of attractions and everyday necessities. Residents are within walking distance to a bank, American Legion, Madeira Shopping Center, fast food, and fine dining restaurants. There are beautiful Gulf Coast beaches a few minutes away for water activities. Bay Pines VA Healthcare facility is less than two miles away. Smugglers Cove Adventure Golf is perfect for a fun miniature golf outing with friends. Active adults can drive to Clearwater in under 30 minutes or reach Tampa in about 40 minutes. St. Petersburg-Clearwater International Airport can also be reached in about 30 minutes. Sea Towers is a great 55+ community in St. Petersburg offering resort-style amenities within a gated neighborhood setting in Pinellas County, Florida. There are plenty of activities available in Sea Towers. Here is a sample of some of the clubs, activities and classes offered here. Sea Towers is comprised of nine high-rise condominium buildings. Condo units range in size from approximately 485 to 1,140 square feet. They typically have a studio to two bedrooms, one or two bathrooms, and a parking lot space. Some condo units feature balconies or lanais, updated appliances, large kitchens, spacious living and dining rooms, Florida rooms, walk-in closets, and scenic water views. Please Note: Floor plans are not available at this time. 55places.com is not affiliated with the developer(s) or homeowners association of Sea Towers. The information you submit is distributed to a 55places.com Partner Agent, who is a licensed real estate agent. The information regarding Sea Towers has not been verified or approved by the developer or homeowners association. Please verify all information prior to purchasing. 55places.com is not responsible for any errors regarding the information displayed on this website.